I did finally get up, having the dogs on my mind. 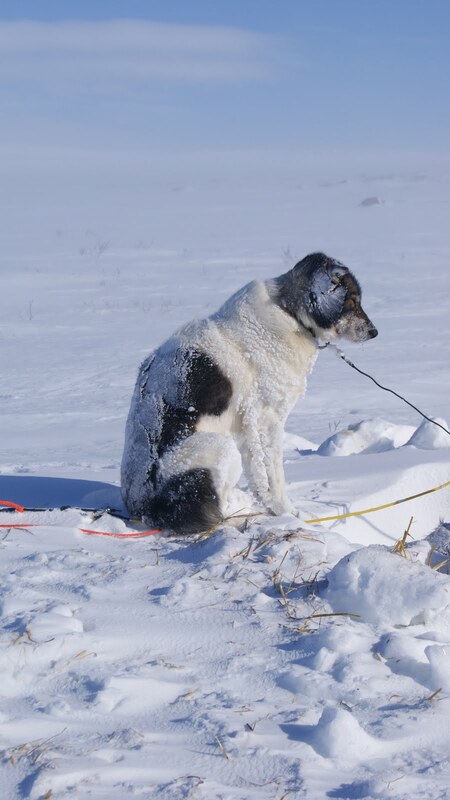 I know that they are working dogs and their coats are used to being snowed upon but they make a pitiful sight, especially those who had clearly been ousted from their snow holes by their teammate. One of the first jobs was to dig them out again and Steve made a head start. As I joined him I realised it was quite a job; first you have the heartbreaking task of getting the dogs out from under their layer of snow so that you can remove the straw and dig a deeper hole, whilst making a higher wall around the side. The wind was coming in from the lake and the snow was falling into the hole because the walls were not high enough. Digging into the snow was easy but making cube shaped bricks and lifting them out to build up the wall proved harder. Within an hour they were all back in their cosy holes, relined with straw and seemingly happy to stay there, whilst the wind blew. Once they were all protected and newly bedded down the team set about their day. Ice fishing was the priority as we were looking forward to the chance of some fresh fish for supper. Andy's a veteran fisherman and Miloš has clearly got it taped so they lead the guard down to the lake and soon Laura, Steve, Andy and Mark were settled on the ice with their reindeer skins. Having spent time together in Norway when we were at college, Rob and I decided to walk there, Rob had been plotting the route on his GPS and it claimed we weren't that far from the border so we set off into the wind, in sight of the fishing team, which was reassuring bearing in mind that our journey was across a lake and the temperatures are rising. It had also been reassuring to watch Miloš drilling through the ice with a meter long drill and only just reaching the water. The Norwegian shore, being much the same as the Swedish one, held our attention for a while but as we hadn't thought about taking any celebratory food or drink, we returned, finding the route back warmer with the wind behind us but still hazardous as we kept breaking through the top crust of ice into the snow beneath. Mark had found his special snow when we got back and was well on the way to completing a double ice hole. It's very impressive, even my claustrophobia couldn't stop me trying it out. He'd built them before in the RAF, over the border, but we were all very impressed. Somehow Rob had conjured up a reindeer stew from the leftovers of last night's feast which was warming and so tender. Andy was still guarding his fishing hole so I took a bowl down to him, trying to keep it warm by covering it with bread. He said he was fine and not really hungry but I've never seen stew disappear so fast! He'd had no luck and had been there for about 5 hours, he's done a72 hour wait before so I wasn't expecting him to go back to the cabin with me. 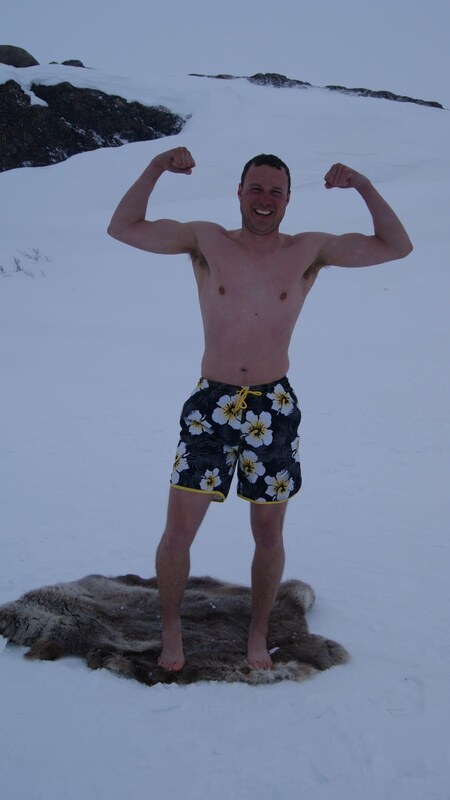 As well the ridiculous photo Mark had to take of himself in his Speedos as part of a fundraising bet, he decided (in his wisdom...NOT) that we should take a series of 'Arctic Madness' photos to make into a charity calendar on our return and somehow he managed to persuade Laura, Andy and I to put our beachwear on and cavort about in the snow... fortunately most of the photos are quite dark as we were in the middle of a snowstorm, so I'm not sure that they are quite print quality. I really don't know where the the day has gone, I went to my tent for a rest and before before long the dark was looming and the wind was getting more and more powerful. We've all taken refuge in the cabin now and I am seriously thinking about making the scuzzy sofa my bed for the night. I've been to look at my tent and it's got snow half way up the outside and it's bouncing up and down like jack in the box. No doubt the boys will tough it out and I'll feel like a wuss.